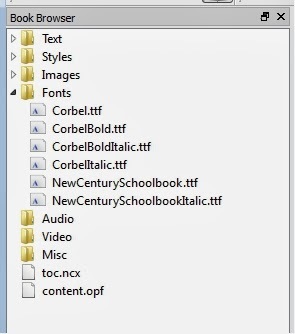 You can now see a list of the contents of the ‘Text’ folder. 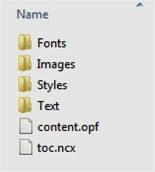 Note that the files are actually .xhtml files. This is a requirement of the epub standard. Xhtml is a very strict version of html. I am using the term ‘html’ very loosely in these posts. Sigil makes correctly formatted xhtml files for you. 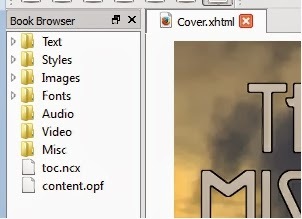 My ebook here begins with a file called ‘Cover.xhtml’. This is an html file containing just the cover image. Each of the other files are the chapters of the ebook. 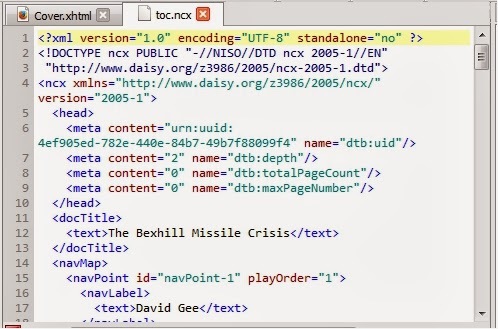 Perhaps it is a good idea at this point to draw attention to the file called ‘Index.xhtml’ in my example. This holds the html table of contents. In this there are hyperlinks to each chapter or section of a chapter within the ebook. 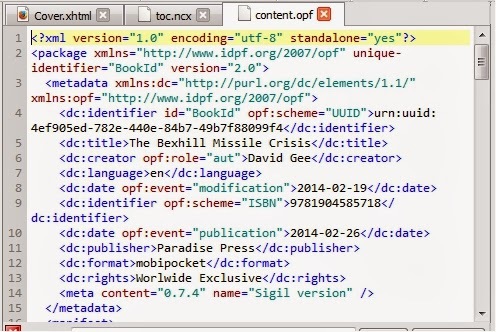 There has to be an html table of contents in an ebook or else Kindlegen will not convert it. 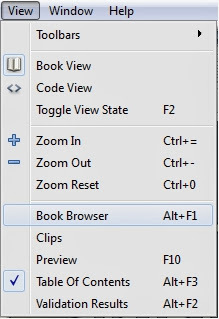 I always end the ebook with a file called something like ‘backCover.xhtml’, which is an html file containing just the back cover of the book as an image. I also put the ISBN of the ebook on the back cover and a barcode. The rationale for embedding fonts is somewhat tenuous. Arguably there is no point in even trying to force the ebook reader to display a font of your choice, as one of the features users like the most about ebook readers is precisely their ability to select the font used. IF you DO embed the fonts, they must be correctly linked in the stylesheet. (See a future post about how to do this.) The kindle will completely ignore any embedded fonts, so perhaps embedding fonts is more trouble than it’s worth. I’m including embedded fonts in this example for the sake of completeness. You might want to ignore this bit. 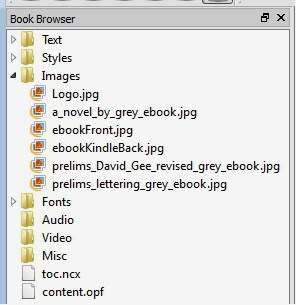 Notice that the filenames in the ebook are all single text strings with NO SPACES. This goes for ALL files, chapters, images, fonts, etc. This is important as epubcheck will chuck out a load of warnings if you have spaces in the filenames. 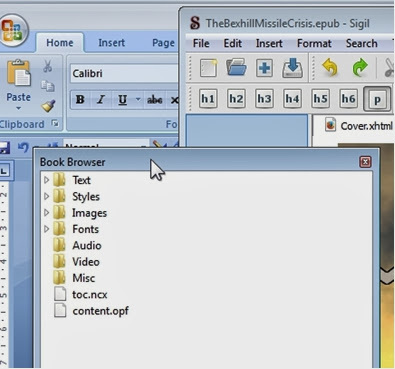 Sigil will take care of putting the files into the proper folders when you create the epub. It all looks very scary for non programmers! Luckily, there is no need to know anything about this file, but I do intend demystifying it in a forthcoming post. 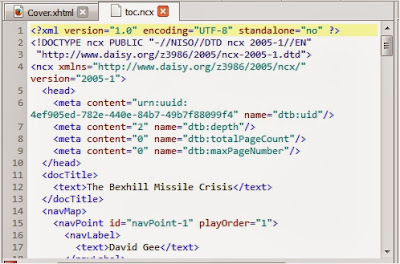 The ncx table of contents is sometimes called a logical table of contents and is in addition to the html table of contents ‘Index.xhtml’ in my example. BOTH are required in a Kindle e-book. (I will link to a post on how the logical table of contents should be linked in the manifest here.) (Click here to find out how to link the html table of contents for Kindle.) 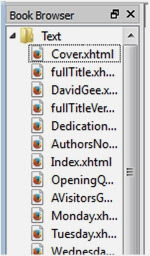 Sigil automatically generates and links the ncx table of contents when you make the ebook. Again, building the logical table of contents using Sigil will be convered in a future post. The file finally ends with a closing </package> tag. Again, I intend demystifying the content.opf file in more detail later. In this post, suffice it to say that the <metadata> section details the metadata for the ebook, such as the title, author, ISBN, date of publication etc. Sigil creates this section for you. The <manifest> is just a list of the items within the epub package and where to find them. It also gives each of them a label (or ‘id’) and specifies what kind of file it is. EVERY item inside the ebook MUST be listed in the manifest. Sigil will do this for you. As you can see, these are just the same as the items which Sigil displayed in the book browser, albeit in a different order. I have left off the extreme right hand side of some long lines, but we don’t need to know anything about this file. All it does is tell the ebook reader where to find content.opf. Sigil creates the file ‘container.xml’ for you. This just tells the ebook reader that it is an epub ebook. Perhaps it is worth pointing out that the items in the epub should be added to the archive in the following order: FIRST the mimetype, THEN the META-INF and FINALLY the OEBPS. And that’s what lies within an epub file. You WILL need to be able to access, understand and edit the content.opf file in order to create an e-book which will convert successfully from epub to kindle format. Each step of the procedure will be covered in separate posts to come.